The pressure for women to look their best is particularly strong, and according to recent research conducted by La Roche-Posay there is a real demand for a complete solution for women who suffer from oily, blemish-prone skin. Women have become defeated, feeling they have tried everything but nothing works. They then look for products that won’t irritate but have given up trying to improve symptoms and skin conditions*. With this insight in mind, La Roche-Posay go three dermatological steps further in addressing the needs of oily, blemish-prone skin with the introduction of a new, highly effective system; providing a simple to use solution with guaranteed no irritation. Working closely with the world’s leading dermatologists, La Roche-Posay has developed a transformative regime based on a dermatological approach to the treatment of oily blemish-prone skin. By combining this dermatological understanding with years of expertise in skin sensitivity, La Roche-Posay introduce Effaclar 3-step Anti-Blemish System. A simple, effective at-home routine. The breakthrough system comprises 3 quick and simple steps - effective alone but when their specific active ingredients are combined within a regime, provide unrivalled results, even on sensitive skin. 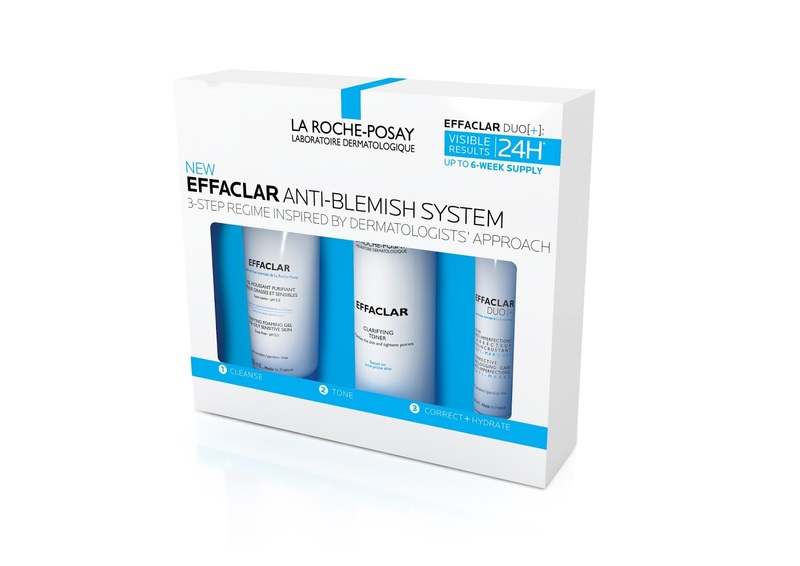 New Effaclar 3-step Anti-Blemish System, features 3 steps that should be familiar to all women. 1) Cleanse, 2) Tone, 3) Correct & Hydrate form the basis of every good skincare regime. Effaclar 3-step Anti-Blemish System adapts this simple skincare principle to deliver proven efficacy on the key signs of oily, blemish-prone skin. 3 simple steps, twice a day - each product has been carefully selected to work in synergy to dramatically improve the skin. The Effaclar 3-Step Anti-Blemish System begins with the best-selling Effaclar Purifying Gel Cleanser, to remove bacteria that may lead to spots, followed by new to the Irish market, Effaclar Clarifying Toner that works to smooth, mattify and tighten pores. Finally, Effaclar Duo [+] corrects the appearance of blemishes, unclogs pores, and reduces the appearance of red and brown marks, whilst providing 24 hour hydration. Not only is Effaclar 3-step Anti-Blemish System clinically proven it includes only the ingredients necessary to treat oily, blemish-prone skin and nothing more, to ensure it is suitable for sensitive skin. Plus the world famous soothing La Roche-Posay Thermal Spring Water can be found in each step. Effaclar Purifying Gel Cleanser helps remove impurities that may lead to the appearance of blemishes. Effaclar Clarifying Toner helps reduce the appearance of pore size and helps refine the look of skin texture. Effaclar Duo [+] Anti-blemish Cream helps to improve the overall appearance of the skin by reducing the appearance of blemishes and red and brown marks. RRP: €34.99 available from pharmacies nationwide.